This guide will help you assess the most prominent features of cabinet selections that will help you better judge the price, style, and installation requirements for your new cabinets. Most cabinets will be constructed of either plywood or particle board. Cabinets made from particle board are typically less expensive, but can be of lower quality. The vinyl layer runs the risk of peeling (on the interior) and can require occasional repairs. 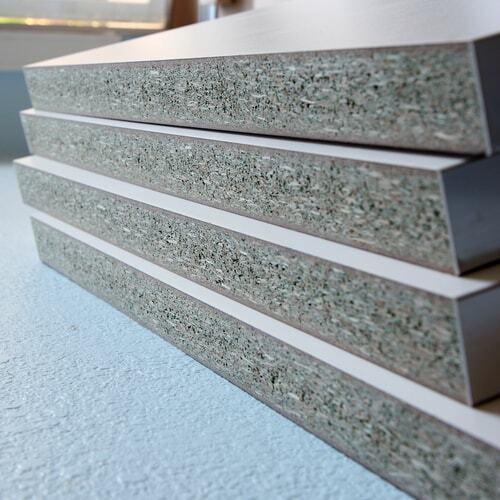 Particle board is more sensitive to moisture and can swell or warp with significant exposure to water or humidity. Benefits of particle board cabinets are: lower cost and (usually) greater availability/lower production time. Particle board is also more dense, allowing it to hold screws and bolts tighter and with less difficulty. KraftMaid and Candlelight Cabinetry offer a particle board option which can help keep costs down. Plywood constructed cabinets are higher quality and tend to last longer. Plywood will give your cabinets a natural wood look and feel, with finer details like grains and knotting that will contribute to the appeal of your cabinets. Plywood is much lighter than particleboard, making it easier to transport. This also helps in the installation of large upper cabinets that may hang from a soffit. KraftMaid and Candlelight offer 100% plywood construction as part of an upgraded package. Thank you. Check your inbox for an email from Page Countryside. The way your cabinet doors hang on the bases and set against the face of your cabinet will contribute to differences in pricing. Cabinetry designed with 1/2 in. overlay door and drawer fronts leaves 2 inches of the cabinet frame exposed between the doors, creating a more traditional look. You may lose some space in your drawers and cabinets when choosing this option. Many homeowners don’t find them as aesthetically pleasing as they do the inset or full overlay doors, but they are usually the least expensive option. A full overlay door style means that there is very little cabinet frame showing around each door and drawer front, creating a living space with a modern, seamless appearance. The one possible drawback with this choice is that the doors and drawers are more likely to interfere with adjacent drawers and doors (or appliances and trim) if not designed properly. On the good side, you may gain a little more usable space with Full Overlay. The cabinets have a more uniform and uninterrupted look. The door and drawer fronts sit inside of the cabinet face frame openings, flush with the face frame. The inset door, closely associated with Shaker, Craftsman and Mission styles, was the first cabinet door type and has been around for centuries. 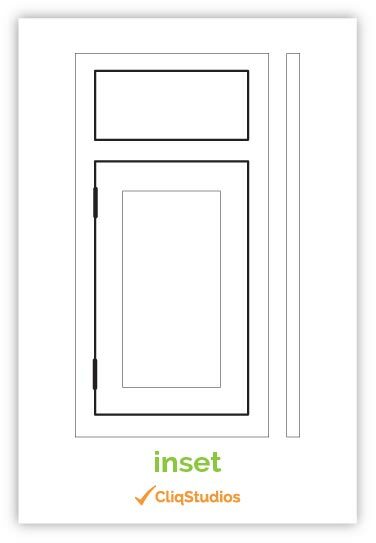 The inset door type requires precise craftsmanship to fit the door or drawer inside the face frame. 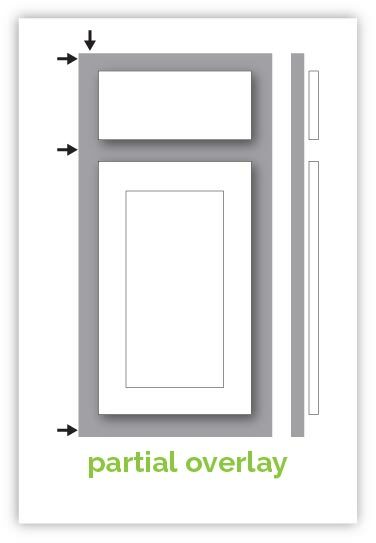 It uses different hinges (revealed or concealed) than overlay styles. Door stops are required in the cabinet box because the door does not rest, or stop, on the face frame when it is closed. For these reasons, inset door styles are typically more expensive than overlay styles. The raised-panel door style, where the center panel rises to the thickness of the door frame, has been by far the most popular style cabinet door over the past 40 years. Raised-panel door styles offer the most detail in the profiles and contours of the center panel and the door frame. This is a versatile look that can complement traditional, transitional and classic decors. The recessed or flat-panel door style provides a cleaner and sleeker profile than the raised panel door. This works well with transitional and contemporary looks. The recessed-panel door has the most flexibility when it comes to design. It's a good choice if you want to be able to change the look of your kitchen down the road. Slab door is the most self-descriptive door construction type – one slab of wood makes up the entire door or drawer front. The slab may be made out of hardwood staves, but most are made of engineered wood (particleboard) covered with hardwood veneer and edge-banded side edges. Sometimes considered a European style, slab doors do not have a frame face. Instead, the doors are attached directly to the cabinet sides. The slab door lends itself specifically to a contemporary style and modern design applications. An open frame door has no center panel; this modification is often requested when a glass insert will replace the panel, but the insert can be almost any material less than ¼” thick. Open frame doors, like mullion frame doors, can be used as decorative accents or for all of the wall cabinets. Base cabinets can also have open framed doors, in which any glass insert must be tempered/safety glass. Some cuts of Cherry can be inconsistent, which is why Candlelight offers a Select Grade of cherry. Paint is more expensive because the wood has to be of very high quality so there are no interruptions (knots, holes) in the grain. The joints also need to be sealed and sanded, then primed, and finally painted. Altogether, this finishing style will increase the price and provide you a stylish, unique cabinet finish option.